As you can read, this squall, this whirlwind, this tornado (which is common in the sea of Galilee) was meant to mess with Jesus and His disciples. It was meant for harm. Do you think the Father wanted to harm the Son? Not a chance. This storm wasn’t from the Father, it was demonic. Was it satan? One of his minions? Who knows. 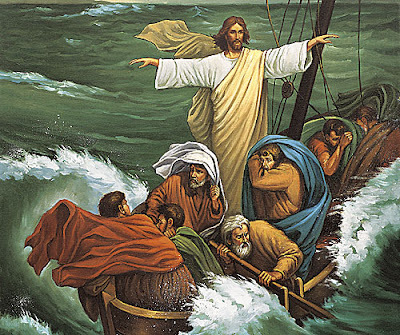 But what is known is that Jesus put the smack down on the storm. The word “rebuked” in Greek is “muzzled.” Jesus muzzled the evil force attempting to attack Him like it was a hapless, dirty mutt. All the evils in this world aren’t from God, because God is good. The evil stems from the absence of good, which is evil. Just like darkness is an absence of light. According to human law, that may be right. But, that’s assuming He uses human laws to justify His actions, or inactions. Being that humans often mess up, and with most legal systems a running joke, why would He want to use our line of thinking? …it comes from bad forces or bad people.